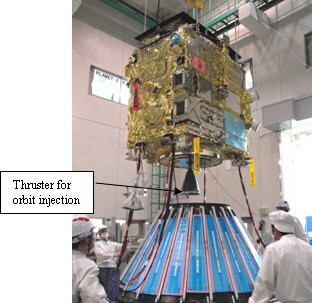 The Venus Climate Orbiter "AKATSUKI," which was launched on May 21, 2010 (Japan Standard Time,) turned on the orbital maneuvering engine (OME) to jet 500 Newton (N)*1 of thruster on June 28 (JST) at a distance of 14.6 million km from the earth or 1.06 astronomical units (AU)*2 from the sun. As a result, we have successfully performed on-orbit verification of the ceramic thruster, made of silicon nitride (Si3N4) for the first time in the world. The thruster was newly developed in Japan. Image: Onboard position of the 500 N class ceramic thruster, whose on-orbit verification was successfully performed. Currently, the explorer and its onboard devices are working properly, and the Ultra-Stable Oscillator (USO) was also found to be functioning well to achieve the frequency stability as expected in addition to the Ultraviolet Imager (UVI,) 1µm Camera (IR1) and Longwave IR Camera (LIR,) whose initial functional verifications were already completed on the launch day evening. 1 Newton (N) is a unit that shows the amount of net force required to accelerate a mass of one kilogram at a rate of one meter per second per second. In other words, it indicates the thrust power of the explorer. 500 N is equivalent to about 50 kg of gravity loaded onto an object on the Earth. 2 One astronomical unit (AU) is an average distance between the sun and the Earth. AKATSUKI is currently flying outside of the earth orbit as scheduled, thus it is in a different environment from the environment that is assumed for operations on the Venus orbit, which is at a distance of 0.7 AU from the sun on average.